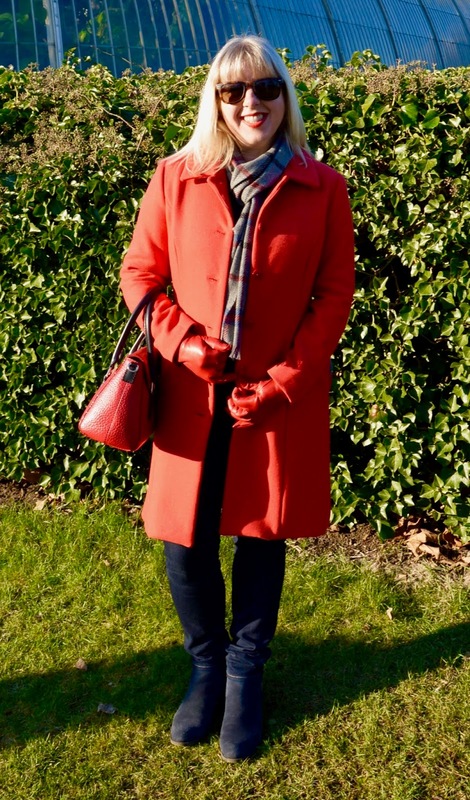 Get the flags out, I've finally finished my red coat! 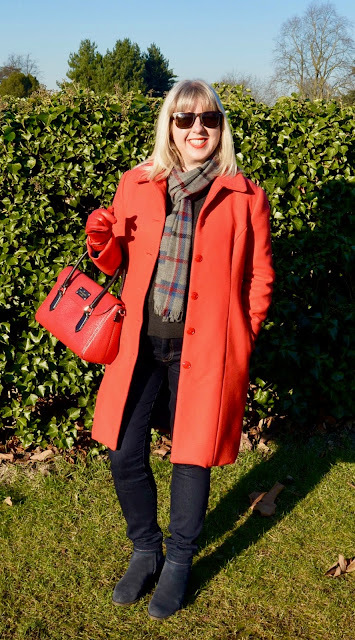 I first blogged about making a red coat back in November, having been gathering supplies to make one for a few weeks before that. As is often the case, it wasn't the main sewing of the coat that took so long, it was the final fiddly jobs (plus a break for Christmas.) It's been a frosty week in the UK so the timing couldn't be better for a warm, winter coat! I didn't want to spam you with tons of photos and text, so for those of you who are interested there's a more in-depth post to follow, with links to all the tutorials and resources I used. I've also kept a record of how much the various materials cost me for this project, which I'll be including too. 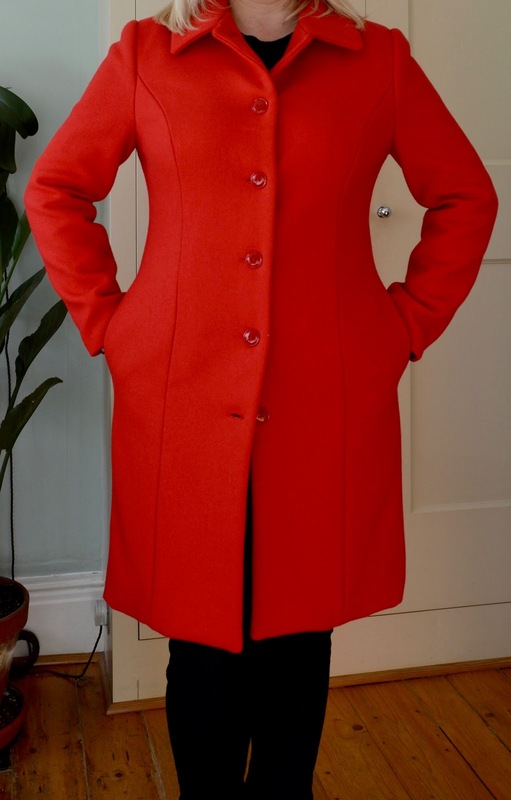 In the meantime, here's my coat in all its finished glory! 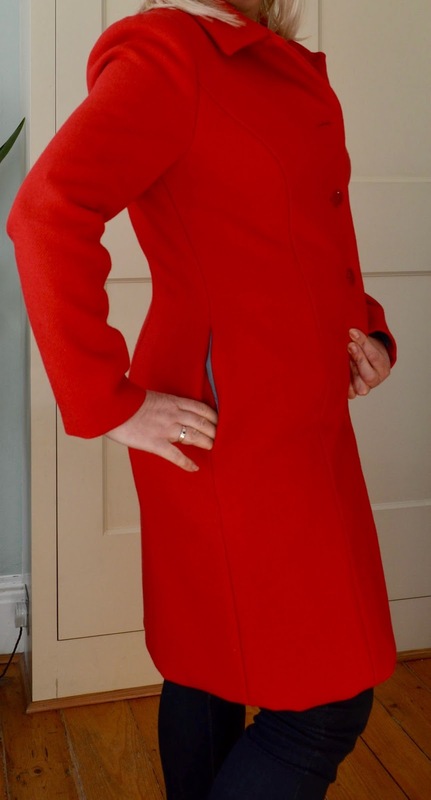 The pattern I used is McCall's 7058: a classic, princess seamed design with several different length and style options. 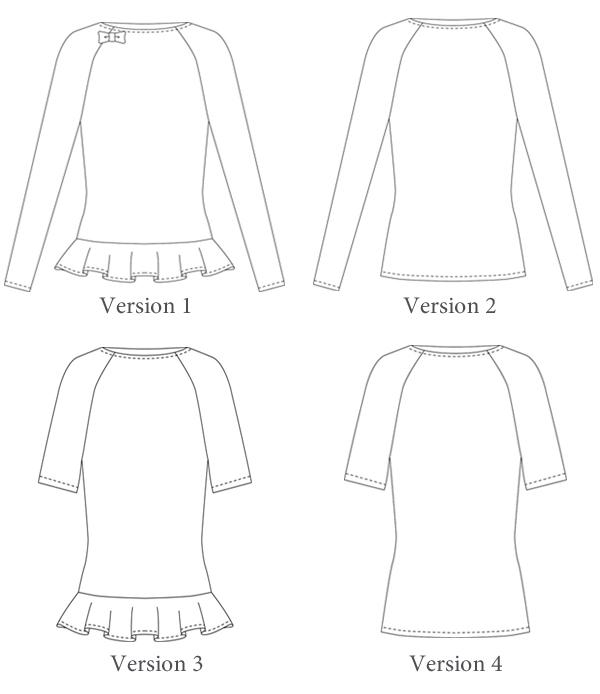 I sewed a combination of versions B and C. Size-wise I cut a straight size 14, but shortened all the main body pieces (including sleeves) on the Petite lines throughout. This equated to two inches in total removed from each piece: one inch at bodice height and one inch at skirt height. Adjusting the pattern to the petite size also meant the pockets were in the correct position for my T-Rex arms! Note: The fabric appears much redder than it actually is in these indoor photos because of the dreadful winter light. I didn't make any further adjustments and the fit was more or less spot on. It's a tiny bit snug when fully buttoned up, as I didn't really allow for extra winter layers (duh), but I'm still really pleased with the fit. It has a lovely, nipped in silhouette. The pattern instructions were clear and easy to follow and the main body of the coat came together very quickly. I only deviated from them at a couple of points: I chose not to include the back vents and I fully bagged the lining by machine rather than hand stitching the sleeve and coat hems. I'll include details of the lining tutorials I used in my next post. 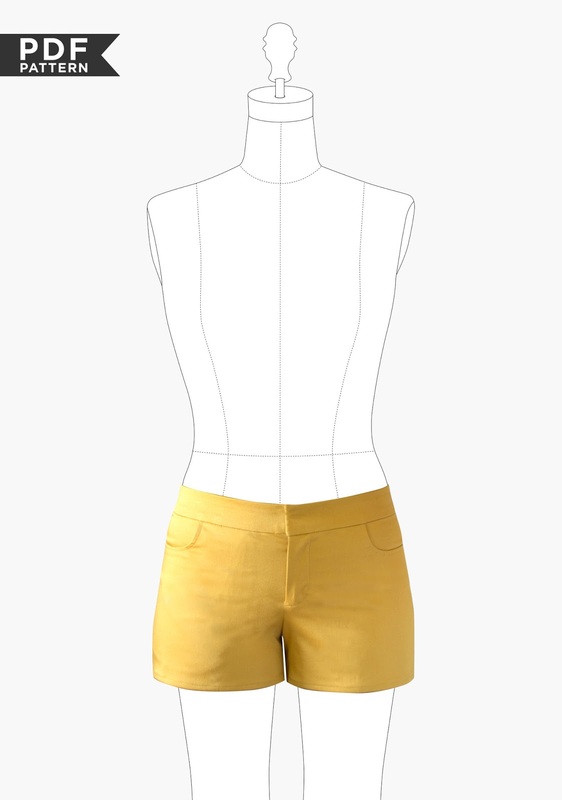 The lining pieces are separate and properly drafted with pleats to the centre back and hem. This makes a big difference when it comes to getting it on and off! 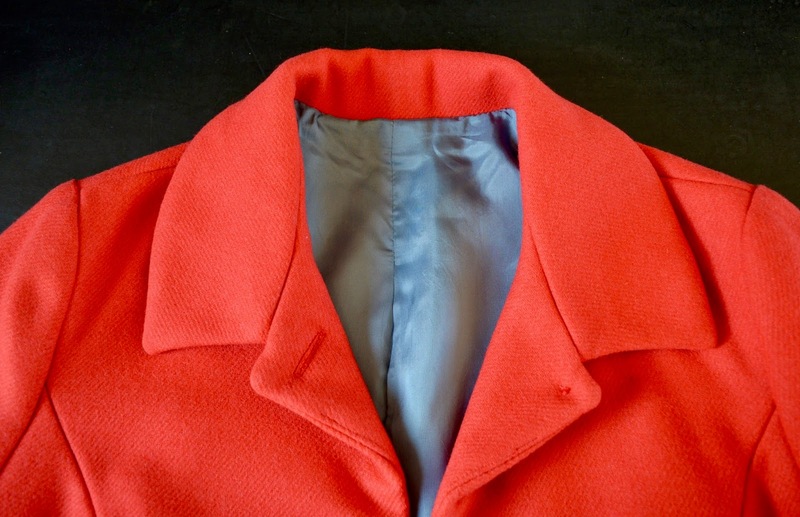 The main coat fabric is an Italian wool twill from Fabric Godmother (now sold out unfortunately). It was quite expensive (£26 per metre), but as it was reasonably wide and my pattern pieces were all shortened, I was able to cut out the whole coat from just two metres, yay! The quality of the wool is absolutely beautiful and I don't regret shelling out at all - it was worth every penny. 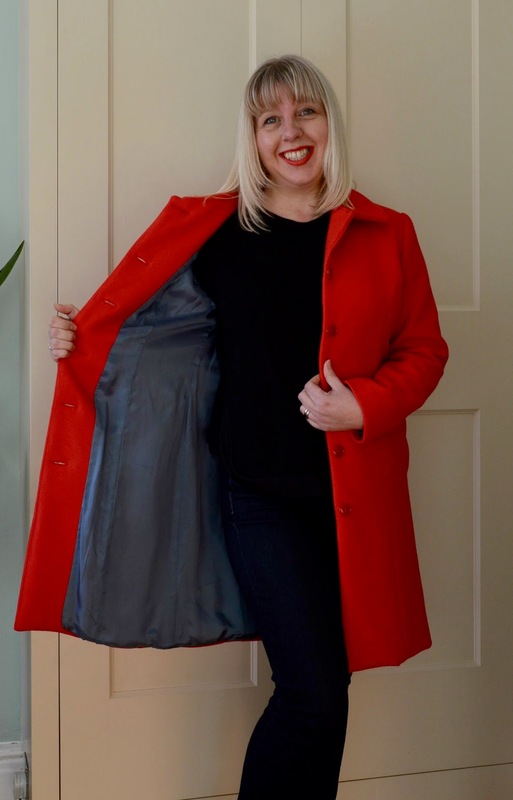 I lined the coat in a contrast dusky blue lining fabric from Ditto Fabrics, (also sold out I'm afraid). All the main coat pieces apart from the under collar and sleeves were underlined with flannel for extra warmth. Two years ago I wrote this post declaring that I would never sew my own exercise gear. I also talked about the (virtually non-existent) role exercise played in my life. Well, one of those things is still true, the other is slowly changing. After trying unsuccessfully to get into running by myself over the years, I finally took the plunge and joined a local running group in October. 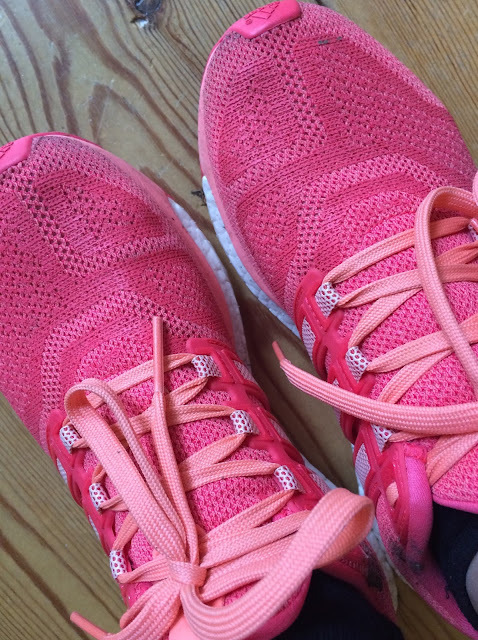 I took their beginner's programme and by the end of eight weeks, I could run 5k continuously. Around the time I started, Kerry also blogged about running and very kindly sent me a few encouraging emails after I left a comment. Thank you Kerry, it was a massive boost! This photo was taken in October - they're now much dirtier! The support and encouragement of the running group (the Ealing Eagles) has been key, I just couldn't do it by myself. I'm now much better at pacing myself (I used to set off too fast and end up half dead after about ten minutes) and it's made a big difference. The update is that I now try to do a 5k run three times a week. This usually includes my local Parkrun which has been brilliant, both for meeting like minded people and making you ran that little bit faster. And there's more... next week I'm starting an Improvers programme, as part of a training plan to build up to a 10k run! Eeekkk! So I now need to eat my words, as I made a couple of declarations in that original post that no longer hold true. Well hopefully by May I'll be running my first 10k race (she says, laughing nervously!) I'm hoping that by writing about it on my blog, it will somehow make it more of an official target! That's no longer true either. I don't exactly love it, but I do really like it. I often find it quite tough to get going, but after a while I feel like Mo Farah, especially at the Parkrun where volunteers cheer you over the finish line! I've noticed lots of benefits too: my legs have definitely changed shape, as has my waist (hoorah!) and it feels good to be doing some regular exercise. I've also personally found running to be a great stress reliever. Living with an autistic son who is currently transforming into a teenager brings a whole new set of challenges, which have been difficult to cope with at times. Running has really helped me calm down and not get so stressed about everything. Plus I find a good blast of bracing fresh air always works wonders! 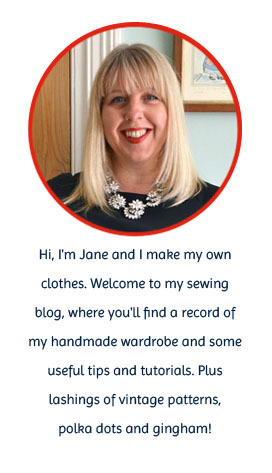 I know this post isn't really anything to do with sewing, so apologies to those of you who come here for the sewing chat. I do have one small sewing related point to make though - I still have no intention of making my own exercise gear! The word on the street at the moment seems to be #2017makenine, an Instagram initiative to make nine items during the course of the year. I can never resist jumping on a bandwagon so immediately started making lists of fabric and patterns. In my typically contrary way, I could only come up with six patterns that I really want to make in 2017 though! I don't want to include patterns just for the sake of it, so my version will have to be #2017makesix instead. 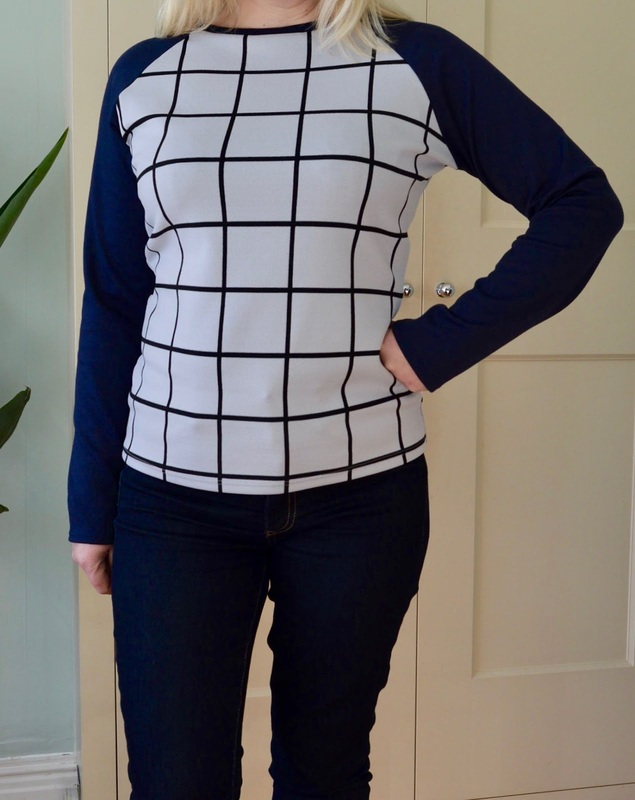 My sewing strategy for the past couple of years has been to sew fewer items and focus more on wearability and fit. This seems to be working, so I'm sticking with it! I have lots of sewing plans spinning round in my head at the moment and am fully intending to sew more than six items in 2017, these are simply the six I've set my heart on. 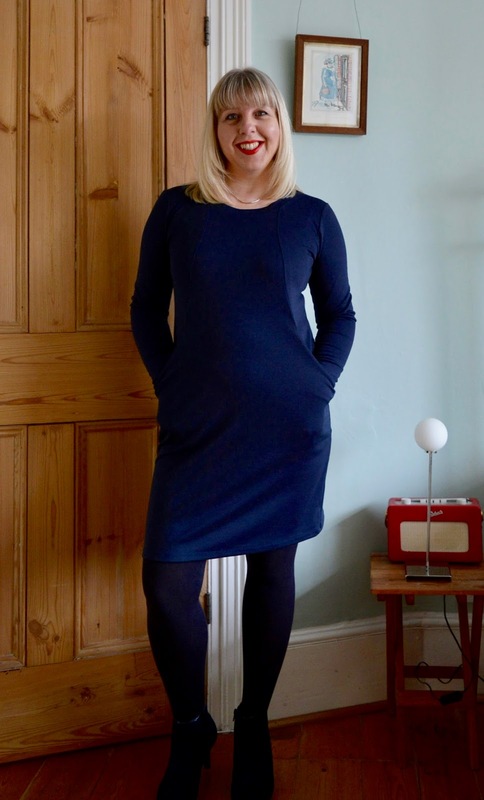 I've had my eye on this dress since it was first announced as a class at Sew Over It, so when it was released as a PDF pattern last year I snapped it up immediately. 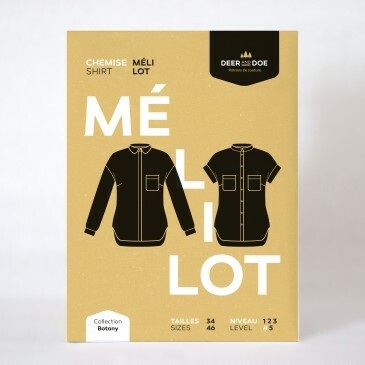 I really like the interesting side panels and pockets and I think it will be a big success in my winter wardrobe. 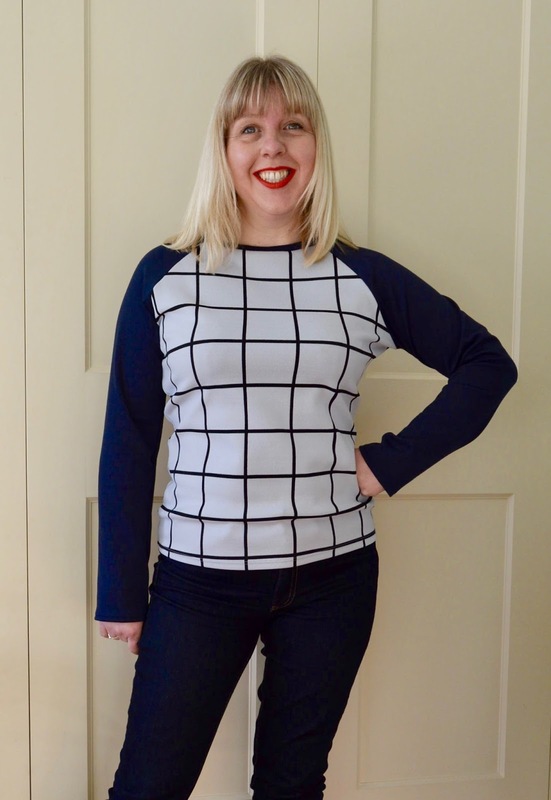 A length of navy Ponte Roma is currently winging its way to me from Clothspot and once it arrives I'll be wasting no time sewing this up. If I can get the fit right I'd like to try a short sleeved version in a lighter knit for summer too. Remember the lace bonded scuba I bought from The Man Outside Sainsbury's last year? Well I think I may have found the perfect pattern to do it justice! 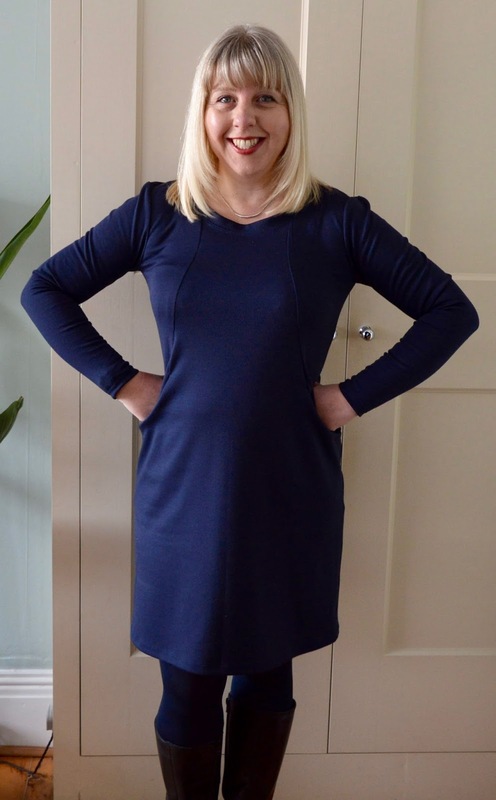 The Sangia dress is a simple, elegant sheath especially designed for scuba fabric, yay! 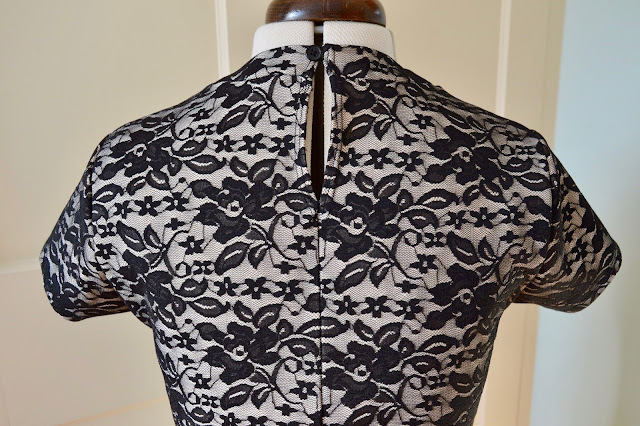 And to further inspire me, Nina has already made a beautiful bonded lace version here, which looks amazing. My simple, kimono sleeved New Look tops were a big success in 2016, so I was on the hunt for a dress version. Yes, I could probably have drafted one myself, but this pattern that I found on Craftsy seems to be absolutely perfect, so I'm saving myself the trouble! For my first version I'm going to use this fab, boat print rayon from Fabric Rehab (sadly they closed for business last year). If that turns out well then I'm already dreaming of a second version in red luxury crepe. This pattern first came to my attention after seeing Rosa's dreamy vision of a dress here. Her dress was a mash up of two different New Look patterns, but it was the wrap style of the bodice that really caught my eye. 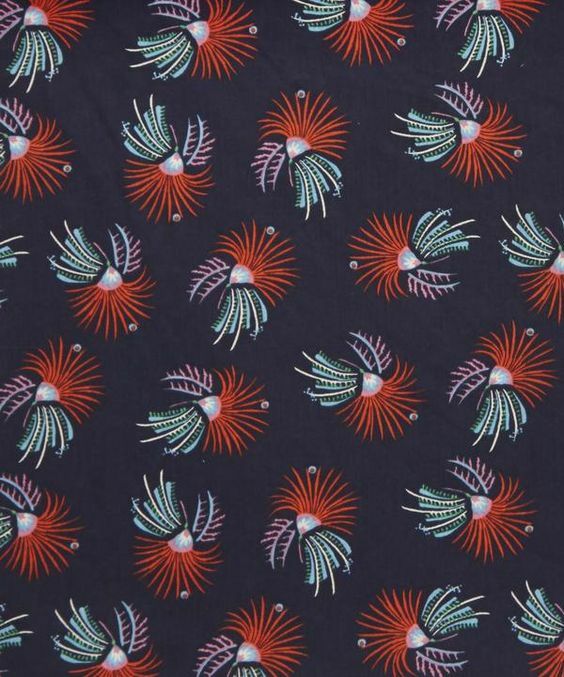 Annoyingly the pattern is now out of print and I promptly fell down a rabbit hole online trying to track down a copy. 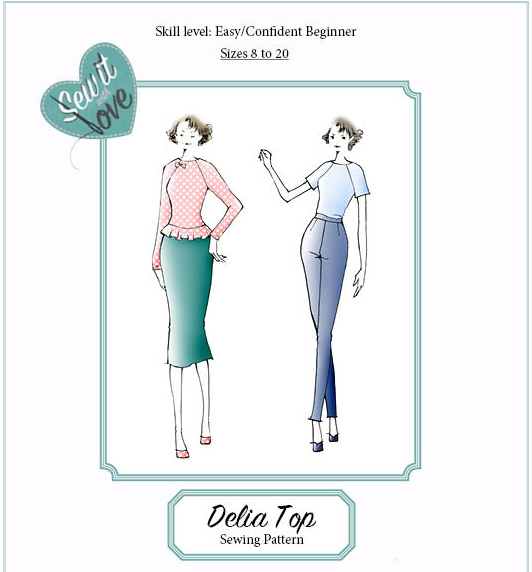 Eventually I found one on eBay and am sooo excited to use it, as the pattern includes lots of different bodice and skirt variations. 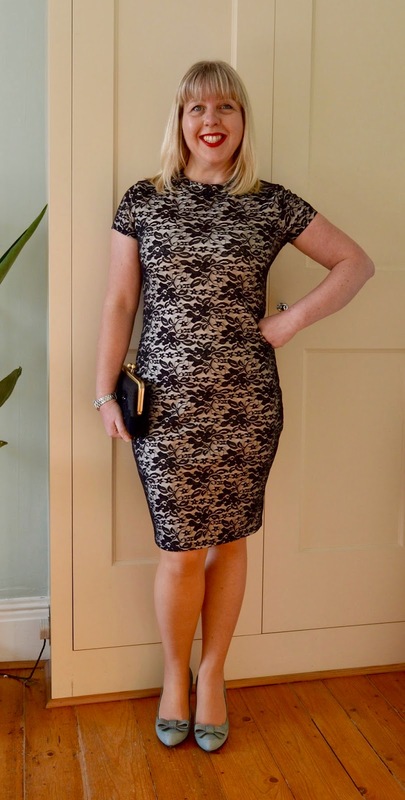 I find New Look patterns are a great fit on me more or less straight out of the envelope, so I have high hopes! 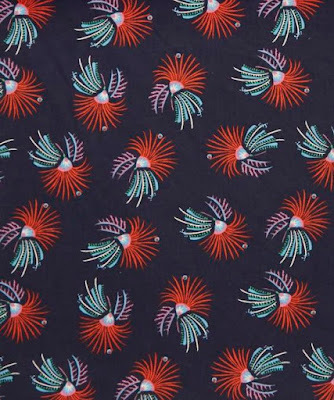 For fabric I'll be using this firework print Liberty Tana Lawn, which was a Christmas present from my lovely husband. 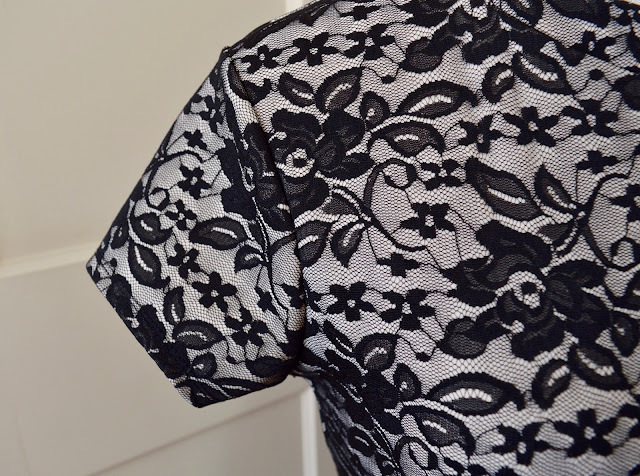 I love a summer shirt and this pattern has some nice details such as dropped shoulders and a rounded collar. 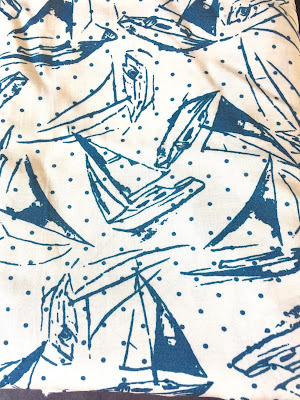 I'll be using a cute sailor print viscose twill that I picked up at a Fabric Godmother open day last year (now sold out). 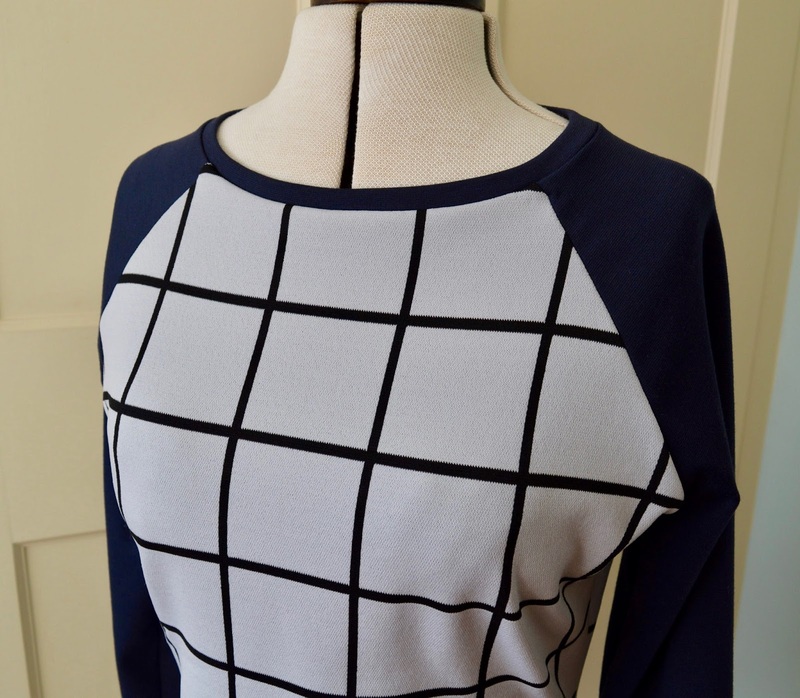 As an aside, I saw a gorgeous version of this shirt worn by a lady at the Handmade Fair in September. It was made from Atelier Brunette fabric, worn with a denim Arielle Skirt and she looked FAB! I chatted to her but I'm afraid I didn't get her name, so if you recognise yourself from this description, please let me know in the comments as your shirt really inspired me! I made a pair of these shorts last year and they were a roaring success on holiday so it makes sense to sew another pair. 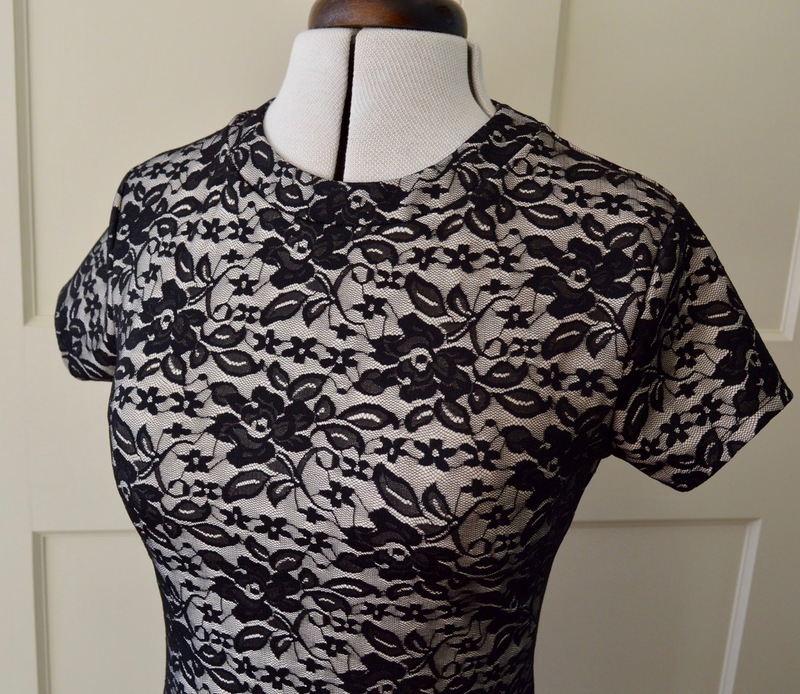 The stretch cotton sateen from Fabric Godmother was a good match for the pattern so I'll be using the same fabric again, probably in red. Hopefully this time round it will be a more straight forward sew, especially if I remember to use the most up to date instructions!